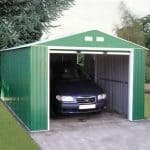 This 10 x 8 metal shed provides a 10 year guarantee against rust. Inside the building is a hot dipped galvanised steel frame. This particular type of steel has been used to prevent rust, but it has also been coated with zinc to provide a great defence against rainwater. It comes with sliding doors, flame retardant safety panels and no floor for heavyweight storage. 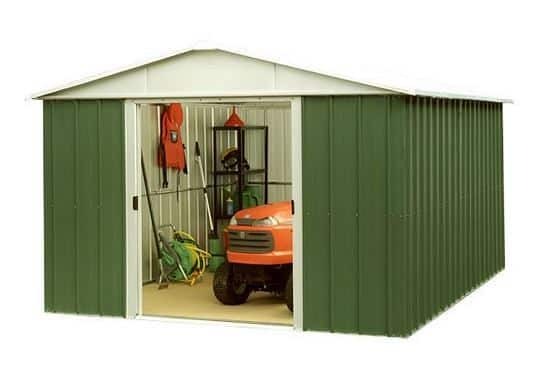 This is a good size, durable metal garden shed with the benefit of an apex design roof. There are a number of reasons why this roof type is beneficial, with the main one being water-resistance. As the water hits the roof, it runs down and away from the shed, right onto the floor. As it doesn’t get a chance to build up on the roof, it won’t cause problems with rust. Just as beneficial is the fact that it also gives you more head room inside the shed. Not only does this make it a lot more comfortable to walk around in, but it also gives you the ability to store tall tools and equipment. The height of the eaves and the roof is taller than your average shed, with the roof measuring 2.03m tall and the eaves measuring 1.63m. When you take into account the 3.50m depth and 3.03m width, you get a feel for just how spacious this shed really is. The doors also provide easy and comfortable access to the building, measuring 1.23m in width and 1.59m in height. Made with metal and vinyl cladding, we love how strong and durable the structure of this shed really is. It has been built with hot dipped galvanised steel, promising an incredibly stable design that will easily withstand daily wear and tear. It has an attractive style and thanks to the metal construction there is no chance of water seeping in through the material. This means your storage space will always be 100% dry. The steel frame keeps the shed extremely stable, ensuring it doesn’t sag or deteriorate over time. It is worth noting that this building has been designed for heavyweight storage. For this reason it does not come with a floor. 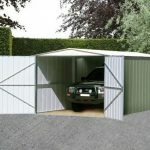 Due to this design, it does mean you will have to assemble the shed on a hard, flat surface such as concrete. It should never be installed on grass or other soft ground. 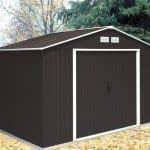 One of the best features of this shed for us is its zero maintenance requirements. It will never need to be treated which means you save a lot of money over time in comparison to wooden garden sheds. Waltons have also given the building a 10 year anti-rust guarantee. 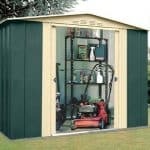 They even supply rust resistant screws to assemble the shed for absolute maximum durability. Like other Yardmaster sheds, this one comes with the unique benefit of sliding doors. The large doors open to reveal easy and hassle free access into the building. Whilst they don’t slide all the way to the end of the building, they still provide plenty of access space. For example, you could easily get a ride on lawnmower in and out of the building with no hassle. The sliding factor also ensures the doors won’t blow shut in high winds. They are fully lockable too so you can be sure whatever you choose to keep in the shed is always fully protected. Another thing we rate about this shed is the fact it is windowless. When you’re storing expensive equipment, bicycles or machinery, it is important to ensure they aren’t in view of potential thieves. With this building it is impossible to see what is inside unless the doors are open. Security is a main feature of this garden shed, with various features helping to make it one of the most secure models on the market. Firstly you have the extremely sturdy galvanised steel frame and cladding. Its strength makes it almost impossible to break into. The fact it is also fire retardant means your stored items are always safe even if a fire breaks out on the outside of the shed. As well as being built from thief-proof materials, the lockable doors also add to the buildings overall security. You will also find this shed to be extremely private. It benefits from being windowless which is not just great for deterring thieves, but it also gives you a secure, private space to work. One thing you may be disappointed about is the lack of customisation options and extras available. However, this can actually be seen as a great benefit of this building. 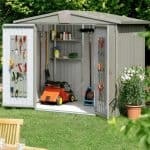 Not only does it mean that the shed comes with everything you could possibly need, but it also means you don’t have to spend extra money doing it up. 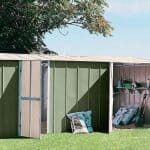 It is durable, secure and extremely weather resistant so you can simply get on with enjoying the shed without worrying about any additional expenses. Typically Waltons only offer one extra for the Yardmaster metal garden sheds and this is an anchor kit. The great news is the kit is included with the shed absolutely free. Its purpose is to make sure that the building is secured properly to the base. Its rust resistant screws are inserted into the base rail where you will find pre-drilled holes. They can be used to attach the shed to either paving stones or concrete. If building on timber decking this anchor kit isn’t suitable. This shed doesn’t just have a high quality aesthetic design, it also oozes quality from the inside too. Every detail has been thoroughly designed to ensure maximum efficiency and durability. As you don’t need to spend any time or money on maintaining the shed, it’s great to see that the shed has a minimum lifespan of 10 years. This is largely down to its fantastic water, rodent and fire resistance. Make no mistake, this is a large building offering a lot of storage space. The floorless feature means you can store more than you could in a wooden shed for example. Overall the shed is pretty simple to assemble, though it will provide some hard labour. Full instructions are provided and you should find them easy to follow. You just need to take into account the labour as well as the time restraints it will take up. For what you get we feel this shed has been really well priced. Not having to spend more money on extras or treatments is a massive advantage and provides maximum value for money. Final Thoughts: When you need a large garden shed but you don’t have a huge budget, we recommend this model. Helping to keep your equipment, machinery and tools both dry and safe for many years to come, it offers incredible value for money. It also benefits from fantastic features and is pretty easy to assemble.